Planning on doing some landscaping in your yard this spring? Tree planting offers a great way to improve your home’s curb appeal and encourage local birds to flock to your yard. But before you start digging, there are a few important things you should keep in mind. 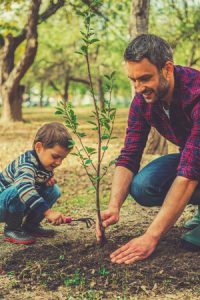 Check out our tree planting tips below! When you first plant a tree, it will most likely be small and unassuming. In just a few years, however, some tree species can grow to become quite large. This may cause problems if the tree’s branches overhang your roof, or if its roots disrupt your home’s water and sewage lines. Try to select a species that won’t overwhelm the space you have in mind, and make sure it has plenty of room to grow in the future. Call before you dig. You’ve probably heard it before, but it can be easy to forget when you’re in the middle of a weekend landscaping project. Although there’s only a slight chance you’ll run into utility lines while planting a tree, it’s always best to err on the side of caution. You can either call the nationwide hotline at 811 or submit an online request here. The hole you dig for your tree should be a wide saucer shape about three to five times as big as the diameter of the tree’s root-ball. The hole doesn’t need to be nearly as deep, though. Your tree’s root collar, which is the trunk flare that sits just above the tree’s root system, should be about an inch above the soil level. Any deeper and your tree might not grow and flourish like you want it to. At Lawrence Tool Rental, we offer a variety of lawn and garden tools that can make your next landscaping project much easier. To learn more, give us a call or contact us online today!